Do neonicotinoid seed treatments work in soybean? 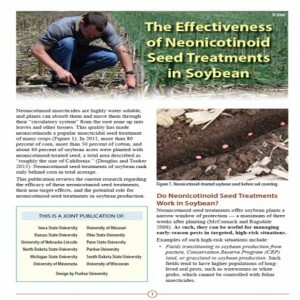 In this new joint publication, we review the current research regarding the efficacy of these neonicotinoid seed treatments, their non-target effects, and the potential role for neonicotinoid seed treatments in soybean production. Recent visits to Edwards county wheat fields revealed spotty but heavy infestations of hessian fly. One field (LCS Mint variety) in particular was planted on Sept. 25th which was just a few days shy of the “fly-free” date of October 1st in Edwards county. In this field the adults likely emerged from the adjacent wheat stubble and then infested the nearby wheat seedlings in mid-late October. If the farmer would have planted after Oct. 1st, some egg laying would still have occurred in this field because many of the adults emerged later than the fly-free date. 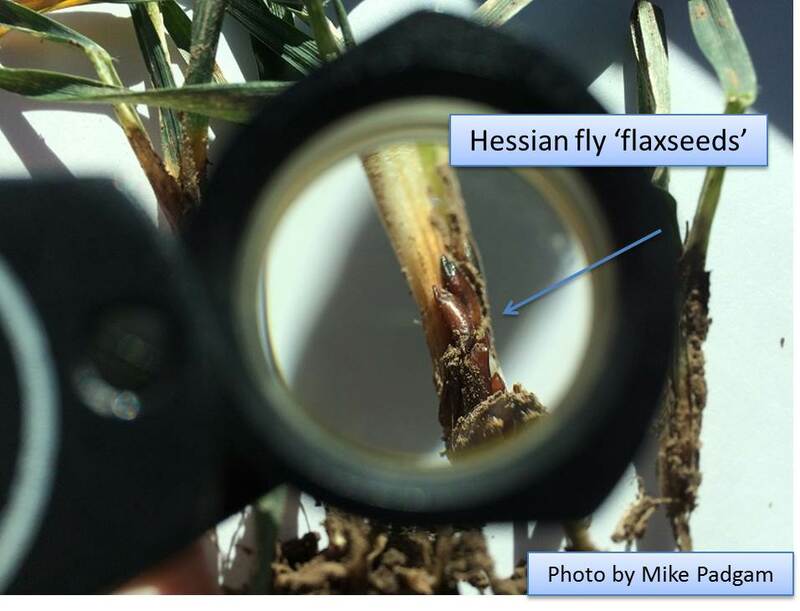 Although this is still a good rule of thumb, the term “Hessian fly-free date” is not completely correct anymore since hessian fly adults can be caught flying up until December in some places in Kansas now. This infestation is likely not limited to Edwards county since large populations of hessian flies were detected in many areas in south-central Kansas last spring. The adults were detected by sweeping wheat fields that were located near wheat stubble or in continuous wheat. Farmers should check now for the puparia or ‘flaxseed’ stage (see below) and will need to weigh further input costs if infested fields are found. 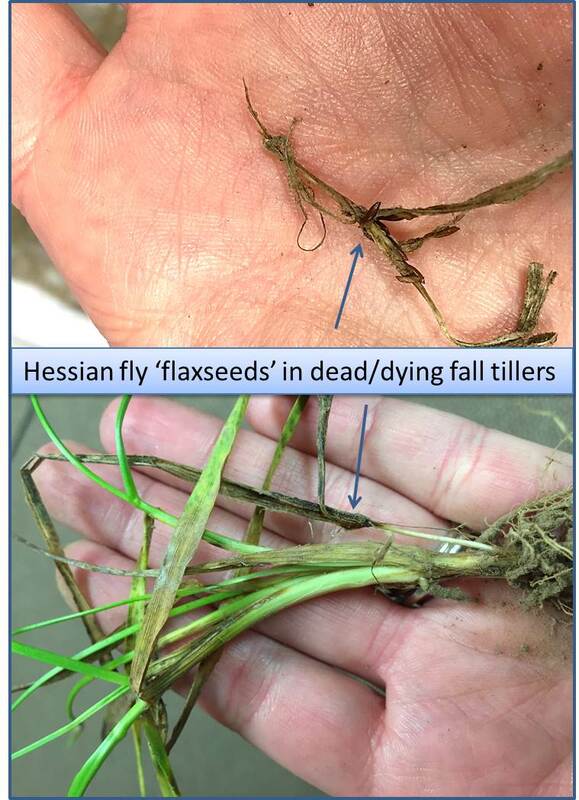 Hessian fly maggot feeding on seedlings in the fall can cause severe injury to plants. Infested wheat is stunted, dark green, and its leaves are broader than normal. Such injured plants will never grow past the four-leaf stage and will generally die during the winter. If tillering has begun, then only infested tillers may die. To scout for the hessian fly in the winter months, peel back the leaf sheaths to uncover the puparia. Flies in the flaxseed stage will usually emerge in March-April as adults and will fly to nearby areas to deposit their eggs onto wheat leaves. 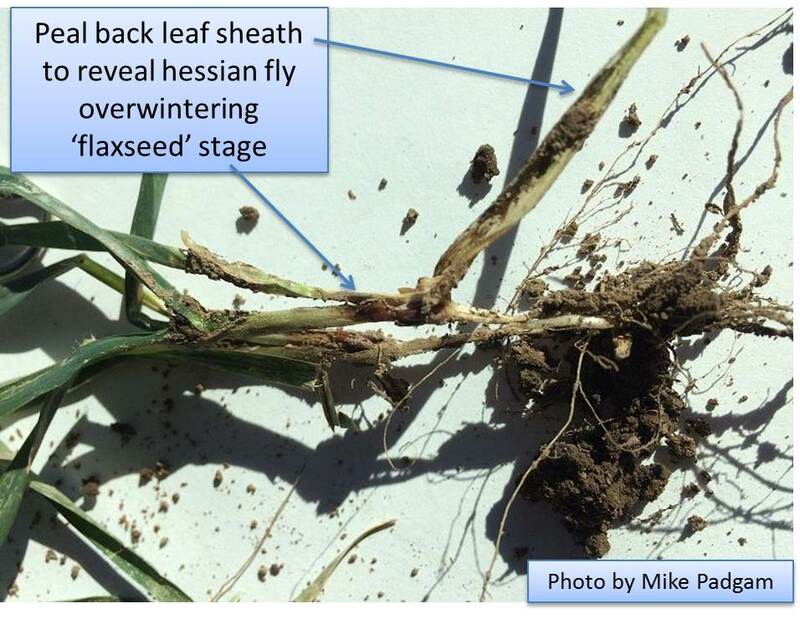 There are no chemical management options for hessian fly maggots or those in the flaxseed stage. 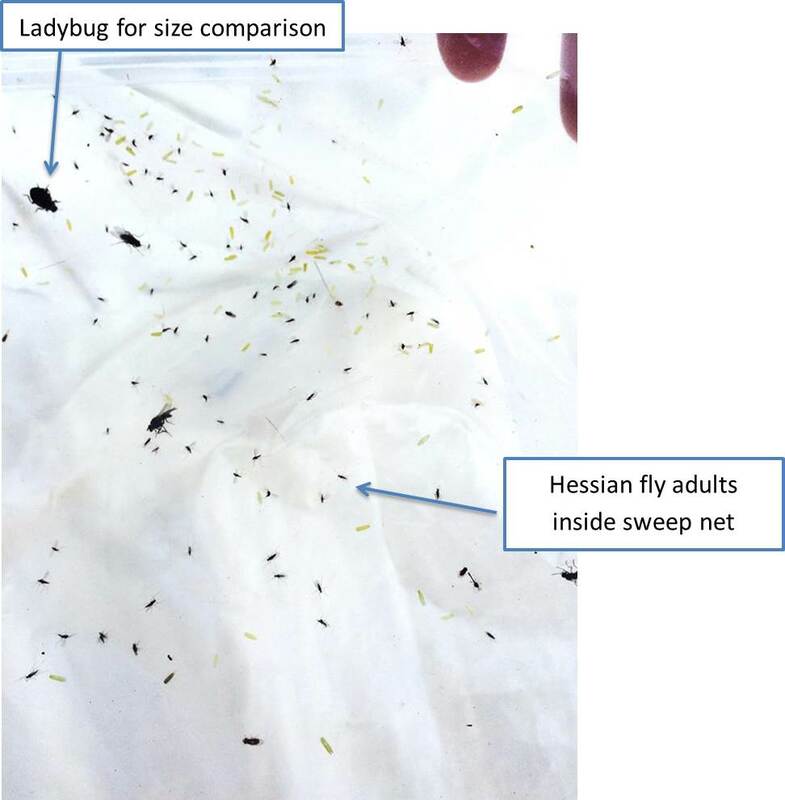 Managing adult hessian flies is not recommended either because emergence can be staggered over a period of several weeks yet adults live for only a few days. The best way to prevent further infestation is to plant varieties of wheat that have greater resistance to hessian flies and plant after the fly-free dates for their county.